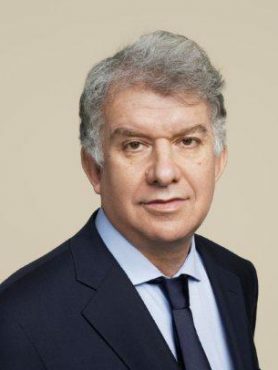 Yves Perrier is Chief Executive Officer of Amundi since its creation in 2010 and a member of the Executive Committee of Crédit Agricole since 2003. He is also Head of the Insurance Asset Management and Real Estate activities for Crédit Agricole Group. As such, along with his position of CEO of Amundi he supervises the Insurance division (Crédit Agricole Insurance) and the Real Estate division (Crédit Agricole Real Estate). Previously he was Head of Asset Management, Securities and Investor Services at Crédit Agricole SA from September 2007 till August 2015. During that period, he oversaw the creation of Amundi and was also Chairman of the Board of Directors of CACEIS, a leading European fund custodian and administrator. Previously (2003-2007), he served as Deputy Chief Executive Officer of Calyon (CACIB today) with responsibility for structured finance, brokerage, risk, support functions and international network. Yves Perrier began his career in audit and consulting (1977-1987). He then joined Société Générale where he held a number of positions between 1987 and 1999, namely Chief Financial Officer (1995-1999), before moving to Crédit Lyonnais as a member of its Executive Committee with responsibility for finance, risk and audit functions (1999-2003). Yves Perrier is also Chairman of the AFG (Association Française de Gestion Financière) since May 2015.